The last tablet Barnes & Noble and Samsung collaborated on was somewhat of a premium product. The Galaxy Tab S2 Nook provided a 2048x1536 resolution on an 8-inch Super AMOLED display, which is plenty sharp for something you're presumably buying to consume books and magazines on. The latest Nook device, the Galaxy Tab E Nook, does not provide that kind of experience. For $250—$150 less than the Tab S2 Nook—the latest model offers a bigger tablet with a worse display. Stretching 1280x800 pixels across 9.6 inches just isn't the same. You also get half the storage space with 16GB instead of 32GB, and the rear-facing camera drops from 8MP to 5MP (granted, who cares?). For more on the specs, read up on the non-Nook Galaxy Tab E.
The Tab E Nook comes with Microsoft Office apps pre-installed, and as you would expect, you get the customized Nook experience. Unfortunately, it doesn't do anything to fill the void the Nook Color left in your heart. 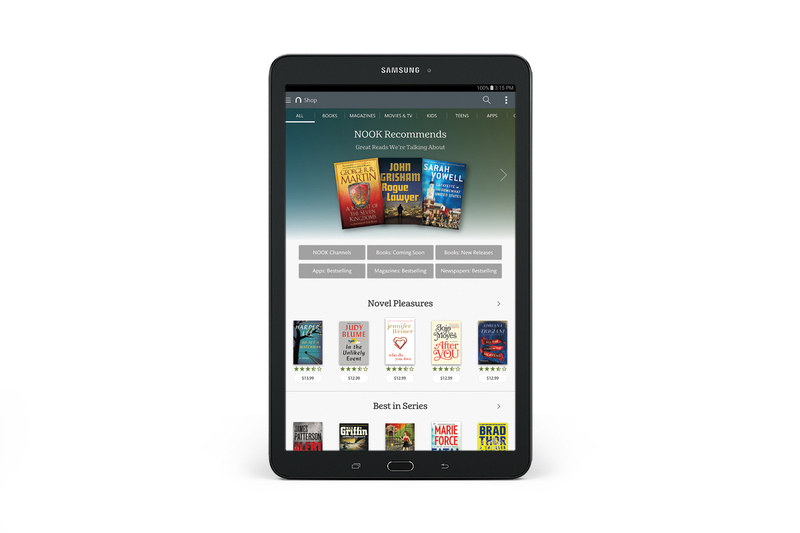 NEW YORK--(BUSINESS WIRE)--Barnes & Noble, Inc. (NYSE: BKS) today expanded its offering of NOOK by Samsung devices and announced a special promotion to help even more customers trade up to one of its newest tablets at an even greater value. In conjunction with Samsung Electronics America, Barnes & Noble introduced the new 9.6-inch Samsung Galaxy Tab E NOOK, a large-screen tablet features Samsung’s stylish yet practical design with NOOK’s extraordinary reading and entertainment experience, perfect for the whole family and now available at Barnes & Noble stores and www.nook.com for $249.99 including a special free limited-time content offering. Barnes & Noble also launched a new Trade-In/Trade-Up limited-time in-store promotion to offer significant credits of up to $200 towards the purchase of a new NOOK by Samsung to customers who trade in select NOOK, iPad®, Kindle and Samsung devices* through November 7. The Galaxy Tab E NOOK offers a large-screen viewing experience in a portable design. A non-slip, fabric-like material covers the back of the device for a comfortable, secure grip. The tablet’s clear, bright 9.6-inch screen allows customers to enjoy NOOK reading content including books, magazines and newspapers in both portrait and landscape mode so they can easily switch between the two depending on the content they’re viewing. And the large display is perfect for any member of the family to watch a host of great movies, TV shows, browse the Web and more. The Galaxy Tab E NOOK features NOOK Profiles™, transforming the tablet into any family member’s customized reading and entertainment center where they can access personalized content and recommendations with a quick tap of the screen. Parents will appreciate the ease of setting up profiles for their children with lots of relevant kid-friendly NOOK content for them to enjoy. Customers can maximize their time and multi-task with ease using Samsung’s Multi-Window, an integrated feature that splits the tablet’s screen to run two apps simultaneously. The built-in 5-megapixel rear-facing camera, 2-megapixel front-facing camera and one-click photo and video controls make it easy to snap pictures and capture memories at a moment’s notice. The tablet’s battery offers long-lasting reading and entertainment enjoyment on a single charge. With 16GB of standard memory and expandable microSD memory available up to 128GB, customers will never be without their favorite content. For previous NOOK customers, Barnes & Noble is offering a great limited-time promotion to help them trade up to a new NOOK by Samsung. Through November 7, customers can visit any Barnes & Noble store to trade in select NOOK devices and receive a $50 credit towards the purchase of a new NOOK by Samsung. Participation in this promotion reduces the cost of the 9.6-inch Galaxy Tab E NOOK to $199.99, the 8-inch Galaxy Tab S2 NOOK to $349.99 and the 7-inch Galaxy Tab 4 NOOK to a remarkably low $99.99. NOOK trade-ins may include NOOK 1st Edition®, NOOK Color®, NOOK Tablet®, NOOK Simple Touch®, NOOK Simple Touch® with GlowLight®, NOOK®HD, NOOK® HD+ and NOOK GlowLight®. Customers can also trade in select iPad®, Kindle and Samsung tablets to receive a credit of $25-$200 towards the purchase of NOOK by Samsung devices. Terms and conditions apply; visit NOOK.com/TradeIn or visit any Barnes & Noble store for details. Over 4 million books including bestsellers, new releases, classics and enhanced titles with special content. An extensive collection of popular comic books and graphic novels, as well as picture-perfect art, photography, travel guides and cookbook titles. An expansive digital selection of best-loved children’s books – over 110,000 – including chapter books and a selection of more than 11,000 interactive picture books. The NOOK Newsstand®, with the largest digital collection of the top 100 bestselling U.S. magazines available for both digital subscriptions and single copy sale, and a vast collection of newspapers and magazines from around the world. Reading tools like ArticleView® lets the reader focus on the text, customized to their needs, and the Visual Table of Contents provides a quick scan of the entire issue, allowing readers to jump directly to any article or section. A large collection of NOOK Apps™ featuring a wide range of uniquely curated titles for the whole family, including fun games, as well as lifestyle, productivity, news, entertainment and other apps. A wide NOOK Video™ selection offering customers their favorite movies and TV shows from major studios and networks, available for purchase or rental. Discovering new content is simple and easy in the NOOK Store, where hundreds of NOOK Channels™ support expert content curation based on interest and sensibility. This popular discovery feature is powered by Barnes & Noble’s breakthrough recommendation system, which combines its bookseller knowledge with advanced algorithmic technology. All customers who purchase a new Samsung Galaxy Tab E NOOK or a Galaxy Tab S2 NOOK can choose complimentary NOOK content from Barnes & Noble. This includes three NOOK Books® from a selection of 20 great titles featuring favorites such as The Gravedigger’s Daughter by Joyce Carol Oates, Think Big, Act Biggerby Jeffrey Hayzlett and On A Night Like This by Barbara Freethy, and three NOOK Magazines® from a selection of more than 25 popular publications such as Cosmopolitan, Esquire and Food Network Magazine. Barnes & Noble also provides customers with a $5 credit to help them get started building their NOOK library. This promotion runs through the end of the year. The new Samsung Galaxy Tab E NOOK is now available only at Barnes & Noble stores and online at NOOK.comfor $249.99, with an additional 10 percent discount for Barnes & Noble Members. All NOOK devices come with free lifetime in-store support. NOOK customers can visit any of Barnes & Noble’s nearly 650 stores across the country for complimentary, personal support, including help setting up their NOOK device and organizing their library. While in-store, customers can speak with any of the company’s expert booksellers, access free Wi-Fi®and enjoy the popular Read In Store® program, which allows guests to read any book free for up to one hour per day. Customers can also take advantage of a full calendar of popular NOOK events, including NOOK Night workshops, family Storytimes, book discussion groups and author signings. * Samsung and Galaxy Tab are both registered trademarks of Samsung Electronics Co., Ltd. Kindle is a trademark of Amazon.com, Inc. or its affiliates. iPad is a registered trademark or trademark of Apple, Inc.